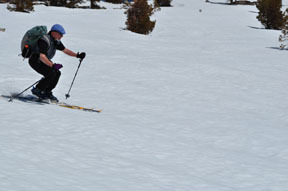 Ten Turn Hill and Rusty's Ridge is a tour for those looking to make turns on relatively steep terrain. Ten Turn Hill steepens as you descend 900 feet while Rusty's Ridge offers 750 feet of continuous, but more modest gradient. Being there at the right time is key to a great ski here; it's a matter of watching the weather and understanding how it affects the conditions. 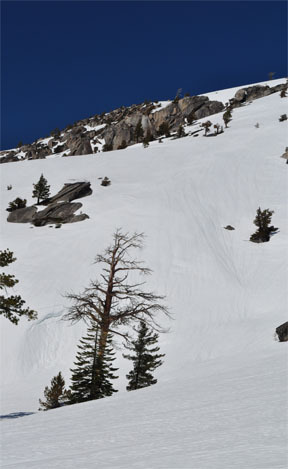 The orientation of the two slopes make corn-snow conditions ideal for this route. Ten Turn Hill faces due south so powder is elusive and Rusty's Ridge faces northwest. Plan to hit this area after a warm spell or in spring when the snow is consolidated. You will find Ten Turn Hill thawed in the early part of the day and Rusty's Ridge thawed in the afternoon. Don't go too late in the spring or else you will find Ten Turn Hill melted down to granite. There is also a 450-foot descent at the very start of the tour that faces south. Unfortunately you will probably be descending this in the morning before it thaws. Oh well, no pain, no gain. These two descents were named by locals who live in the area. While on the ridge top overlooking Bear River during a scouting trip, Chris looked down the hill and said to Dallas, "this looks good, I'll just make ten turns." Shortly they were at the bottom reveling in exhilaration and Ten Turn Hill got its name. Chris and Dallas named the Rusty Ridge decent after their dog Rusty who was there constant companion for many years of skiing here. 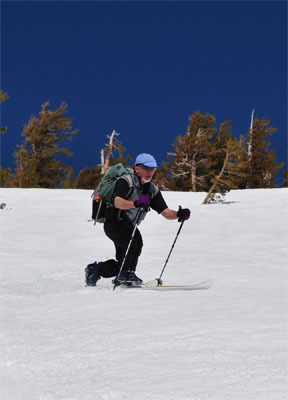 For those who want to ski Rusty's Ridge, but not Ten Turn Hill, it is only 4.4 miles by this route or it can be reached via the Shot Rock to Bear River tour. 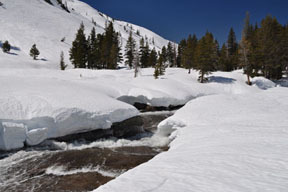 Cross the creek, exit the trees near the creek and then ski southeast for 0.3 mile until you reach Tragedy Creek (4). Ascend a ridge to the southeast for 0.4 mile until you reach Peak 7630 (5). Ski slightly east of south for 0.7 mile until you reach the south edge of a plateau (6) where the terrain begins to fall-off. You are now at the top of Ten Turn Hill. 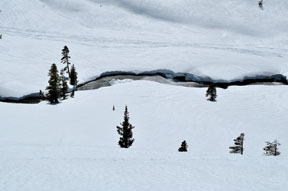 Descend southeast for 0.5 mile until you reach the Bear River (7). 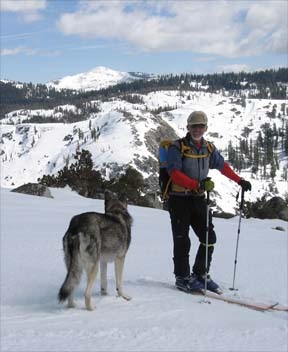 To bypass Ten Turn Hill and descend Rusty's Ridge, ski southwest along the ridge from mileage point 6 for 0.2 mile until you reach the southwest end of the plateau (10) and continue following the route described from mile 4.3. Ascend east along the north side of Bear River for 0.5 mile until you reach a location where you can ascend to the northwest (8). Ascend northwest for 0.6 mile until you reach the edge of a plateau (9). 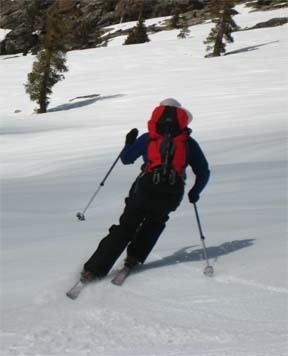 Ski southwest for 0.6 mile until you reach the southwest end of the plateau (10). 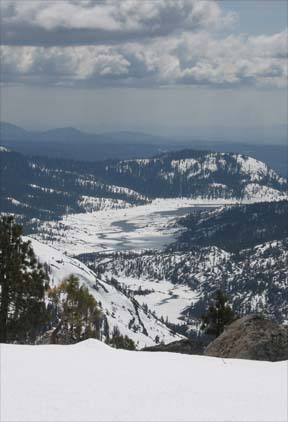 From here you have a wonderful view of Bear River and Lower Bear River reservoirs. Descend the barren slope to the northwest for 0.5 mile until you reach the location where the gradient lessens and you see a passable route north (11). As you descend you should stay to the right of the trees that correspond to a minor drainage. Ski north for 0.4 mile until you reach Tragedy Creek (12).